The Republic of Korea has been a leader in training government officials to be catalysts of economic development. The Government of the Republic of Korea established a civil service training plan that reflected the needs of economic development policies. By law, the Ministry of General Affairs (MOGA) was required to establish an annual education and training plan and convey it to the heads of government ministries, agencies, and training institutions. MOGA, in its annual plan for education and training of government officials, reflected in the plan the major policy decisions of the Cabinet. In particular, training programs were newly developed or aspects of existing programs are reorganized accordingly. The Planning Program is a case in point. This program was opened to teach skills and techniques in planning to government officials working at planning offices in central ministries and agencies. This program supported the offices of planning and coordination established by the military government in central government ministries in 1962 in their efforts to effectively implement the First Five-Year Economic Development Plan. Another example is a series of courses on new managerial techniques for midlevel officials added by the Central Officials Training Institute (COTI) to existing programs in 1967. The courses included: the Program Evaluation and Review Technique (PERT); the Critical Path Method (CPM); the Operational Research (OR); and the Program Planning and Budgeting System (PPBS)—all were very useful for establishing development policies. At that time, the government of the Third Republic needed to foster competent officials who could conduct planning tasks to prepare for the Second Five-Year Economic Development Plan. Even though the government lacked the necessary facilities and systems, it still provided advanced courses on managerial and statistical techniques to mid-level officials. Thus we can view such training as preemptive or concurrent—a strategy to equip midlevel officials with the advanced knowledge and techniques they would need to design and execute development policies. In the 1980s and 1990s, much research was conducted on the outcomes of capacity building for government officials of developing countries. The researchers found that in general, training activities focused on skills and knowledge transfer do not ultimately lead to performance improvements in governmental organizations. The reasons for this failure were identified as the following: demotivating organizational cultures; the underutilization of qualified people at management level and in organizations overall; ineffective communication, lack of professional norms, and weak teamwork; and the brain drain to the private sector. This does not necessarily mean that training focused on skills, knowledge, and technology transfer is not important for the capacity building of government; it rather indicates that something more is required in order to see real performance improvement in government. Although it is impossible to fully apply the Republic of Korea’s experience to developing countries, several implications can be drawn from the country. Policymakers in underdeveloped countries who are pursuing national development should prioritize civil service training. Government organizations play important roles in underdeveloped economies where civil society and the private sector are relatively weak. The Government of the Republic of Korea government stipulates that government officials newly employed or due for promotion attend training programs before assignment. Appropriate training is provided preemptively to ensure that job responsibilities at each stage of development can be carried out accurately and effectively. One reason for the success of civil service training in the Republic of Korea is its solid legal and institutional foundation. The government enacted and revised laws concerned with civil service training and training institutions from the beginning. The institutionalization of legal and organizational frameworks has provided a solid foundation for continuous civil service training in the country. 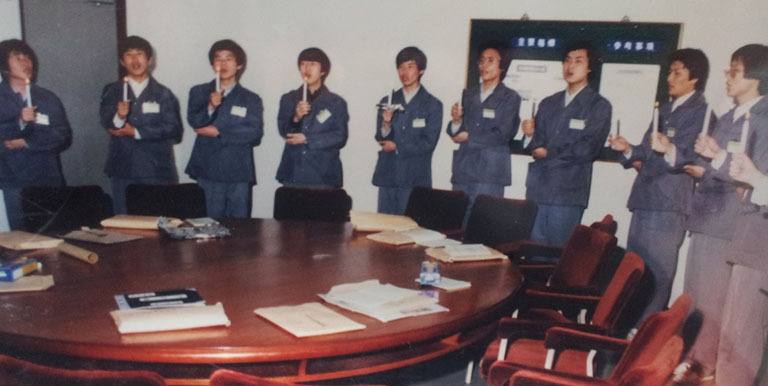 The Korean training system which bridged government policy and training contents maximized the effects of training on the capacity development of government officials. It also raised organizational capacity by utilizing and integrating the accumulated capacities of individual officials to the greatest effect. The Republic of Korea emphasized public service ethics training for government officials as well as skills, knowledge, and technology training. Through public service ethics training, government officials formed public servant mindsets and solidified their loyalty to government. he contents of training programs should be developed from the trainees’ perspective, not from the provider’s perspective only. Of course, government needs to reflect its policy direction in training programs. However, officials know well what they need to perform their functional responsibilities. It is important to reflect the needs of existing officials. The government conducts needs analysis on a regular basis in order to improve the quality of its training programs. Public service ethics training is the most conspicuous feature of the Korean training program for government officials. In the period of economic development in particular, the government emphasized public service ethics training accompanied by knowledge and skills transfer. Public service ethics training had two goals: to secure the support of government officials in order to maintain control over government administration; and to change the public servant mindset. From the military government onwards each political regime continued public service ethics training under various banners. Below is an excerpt from a training textbook for mid-level officials which emphasizes the value of public service ethics training. Public service ethics training was provided in three ways. First, it was operated as a separate program independent from other training programs under various banners in each government: Anti-communism Training in the Third Republic; Saemaul Training (Figure 3) in the Fourth Republic; and Ideological Training in the Fifth Republic. Such training included courses like “Analysis of Corruption in the Public Administration of the Previous Government” during the period of the military government; and the “International Situation and Defeat of Communism” and the “Mission and Discipline of Government Officials” during the Fourth Republic. Third, field activities were utilized to provide public service ethics training. For example, trainees would be grouped into several teams with each team working together on a team project. Trainees in the grade-based basic job training program undertook field visits to rural areas, industrial complexes, and historical sites as well as to other government offices. These activities helped to cultivate the public servant mindset of trainees and provided deeper understanding of the processes involved in the development and practice of government policies. Though the course names differed according to the administration, the goal of public service ethics training was basically the same: garner the loyalty of government officials in order to realize the policy agenda of individual governments, and imbue government officials with the public servant mindset. The Government of the Republic of Korea employs commissioned training which is conducted by private or public institutions other than government training institutions for government officials. Commissioned training is divided into two kinds: domestic training and overseas training. Domestic training. Domestic commissioned training is composed of several programs such as long-term training for the director-general and manager levels, college and postgraduate training, and short-term training. Long-term training for director-general and manager level officials is conducted in public institutions for one year. College and graduate training provides government officials with opportunities to attend graduate programs at universities with financial support from the government. Selected midlevel officials attend evening graduate schools for earning master degrees. Short-term training includes both foreign language training and 3-day special skills training programs at private institutions. Overseas training. Overseas training was first introduced in 1977 as a means for the government to benchmark the science and technological knowledge of advanced countries; it was expanded to include all areas of government ministries in 1979. Originally, overseas training programs were divided into two kinds: professional job training and the degree program. In the professional job training program selected officials work or research in international organizations or with foreign governments for a certain period of time. The degree program is a 2-year academic program wherein selected officials are given the opportunity to study overseas in graduate-level programs related to their governmental positions. Ministry of Personnel Management (MPM) sends one or two applicants from individual government ministries for the overseas degree program each year. When the military government initiated the capacity building of government officials in 1961, the government established a system wherein the policy-making authority directly controlled the training institution. The Supreme Council for National Reconstruction (SCNR), the highest policy-making body of the military government holding both legislative and executive powers at that time enacted the Government Officials Training Act (GOT Act) and established the Central Officials Training Institute (COTI). Besides, the government established the Education and Training Department within the Ministry of General Affairs (MOGA) in order to take charge of capacity building for government officials from a central government perspective. Accordingly, while the Education and Training Department was responsible for establishing an annual plan for government officials training, COTI was in charge of providing training programs. When the government later allowed central government ministries and provincial governments to establish their own training centers for the teaching of specialized functions, COTI’s responsibilities expanded to include supervision of these centers’ training activities. Central government ministries controlled the training of government officials. Specifically, COTI (for central government officials) was under the supervision of MOGA and the Local Administration Training Institute (LATI) for local government officials was under the purview of the Ministry of Home Affairs (MOHA). Individual ministries ran their own training institutions specialized in the designated functional areas and provincial governments also operated training centers. K-Developedia. Civil Service Training: Nurturing the Driving Force of Economic Development in Korea. K-Developedia. A study on government employee's training strategies : A case study of the new managerial official course. His research interests include civil service training, local governance, leadership, and government reform. His work has been published in reports of the Korea Research Institute for Local Administration, Korea Institute of Public Administration, and Institute of Developing Economics in Japan, among others, and in academic journals. He earned his bachelor’s and master’s degrees in Public Administration from Hankuk University of Foreign Studies, and PhD in Political Science at the University of Delaware. His research interests include Civil Service HRM, HRD, e-Government, Government Innovation, Local Government and Inetrnational Development Cooperation. His works have been published in reports of the Korean Economic Research Institute(KERI), in journals of Korea Society for Public Personnel Administration (KOSPPA), in books of Ministry of Government Administration(MOGA). He has worked for Ministry of Government Administration, Office of the President, Gyeonggi-Provincial Government, Central Officials Training Institute (COTI), Civil Service Commission, Ministry of Public Administration and Security, amd Government Employees Pension Service. He completed his BA in Public Administration from Korea University, MSc. in Public Policy from London School of Economics and Political Science, and Ph.D. Course in Policy Studies at Department of Public Administration, Korea University.